Kukors is the 2009 world champion in the 200-meter individual medley and placed fifth in the 200-meter individual medley in the 2012 Summer Olympics. Hutchison was an assistant USA Swimming Olympic coach in 2008, but resigned from the position in2010 amid rumorsthat he was having a sexual relationship with one of his swimmers. He still coaches swimmers in Seattle and is stilllistedas the owner of King Aquatic. The former swimmer said she only recently realized Hutchison abused her. Delayed reporting is somewhatcommon for victims of child sexual abuse. Seattle’s Homeland Security Investigations division searched Hutchison’s Seattle apartment on Tuesday and recovered electronics that could contain evidence,SeattlePI reports. Hutchison, 46, allegedly took naked photos of Kukors without her consent when she was 17. 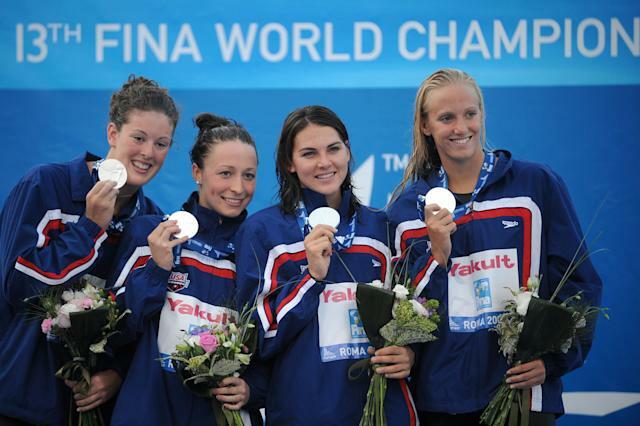 Kukors celebrating with teammates Dana Vollmer, Lacey Nymeyer and Allison Schmitt&nbsp;after winning&nbsp;their silver medal on the women's 4x200-meter freestyle final on July 30, 2009, at the FINA World Swimming Championships in Rome. Kukors’ allegations come on the heels of hundreds of accusations of child sexual abuse against former USA Gymnastics team doctor Larry Nassar. Nassar has been accused of serial sexual abuse by over265 women and girls and was sentenced to two concurrent sentences of40-175and40-125years in prison. Dozens of elite swimming coaches havebeen accused of sexually abusingtheir athletes over the years. Arecent bill passed in Congresshopes to protect young athletes from predators like Nassar in amateur sports including swimming and gymnastics.